18V ONE+™ 9 IN. Edger is rated 4.6 out of 5 by 236. Rated 5 out of 5 by DaveD from Perfect tool for what I need I recently moved from New York where my grass was Kentucky Blue grass. Edging with a string trimmer was not a problem. Here in Georgia the grass is a vine like Centipede type and my Craftsman string trimmer uses a lot of .060" string to cut through the vines. I bought my first Ryobi because my friend back in NY swears by the One+ 18V tools. Using the Ryobi Edger made edging up my sidewalk and driveway go quickly, it was easy and it looks so professional. My wife likes the edging job too and now wants me to edge the flower gardens where the adjustable depth will really come in handy. I am looking forward to getting many more of the One+ tools. 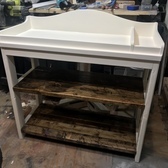 Rated 5 out of 5 by jeffinaustintx from Works better than expected Got this via Home Depot - home delivery and put it to use the day it arrived. Super impressed. I was skeptical that the 18 volt would not have enough power to cut through the grass but I was so wrong. We have used this everywhere - along the side walk, around the garden and around the pool, all with excellent results. I was originally looking for a 40v version but the 18v is perfect. 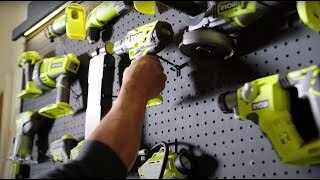 We already have 5 batteries on hand for the number of other Ryobi tools that we have so we have plenty of reserve power for big runs. I am soooo glad we bought this - highly recommended! Rated 5 out of 5 by Jdnpdx from Did the job well! Worked great, but this is a consumer product and not for pro landscapers. The yard has been neglected and probably not edged in 10+ years, this edger did a fantastic job. Over 1000 linear feet of edging and in most spots cutting off 8-12" of over growth. I did go through 7 fully charged batteries, but thankfully I own several Ryobi 18+ tools. Happy to have added this to my collection. 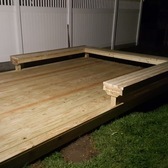 Rated 5 out of 5 by Russ from Much better than edging with a string trimmer I have one of those yards that tries to overtake the sidewalk very quickly. No matter how much I use the string trimmer to cut back the grass, it seems to creep back onto the walks in no time at all. Growing up, my parents had gas powered edgers that worked great to keep the grass line well manicured. I purchased this edger in hopes that it would do the same. Since I already own quite a few Ryobi batteries, I wasn't worried about running out of power. It also helped that this edger came with a battery and charger too. I have to say that I am impressed with how well this works! The max depth of the cut is about an inch and a half, which is more than enough. 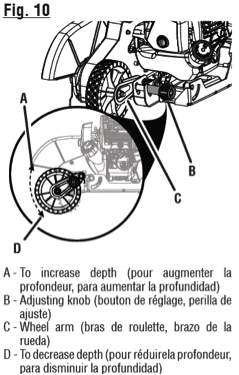 The guide wheels help to keep things straight as well as keeping the depth consistent. Definitely easier than using the string trimmer, and much easier than using a gas powered edger. I wish I had one of these years ago! My yard now looks like a professional did the work. Definitely recommended! Rated 4 out of 5 by bradhoff from works right I've been using mine for a few years and it works just the way I'd want it to! Rated 5 out of 5 by Mike Miller from Ryobi bladed edger I have been looking for this product for awhile. My local Home Depot doesn't sell it. They do sell the Expand series but not a stand alone. I ordered this online on a Sunday and received it Wednesday. I am very happy with the crisp lines these leaves. I was using my Ryobi Trimmer/Edger for the last 2 years and just wanted a cleaner edge. The first time I used it I tried it at the deepest setting and it would get hung up. I adjusted it to the shallowest setting and it worked wonderfully and every time I used it I moved it to the next setting. Now I use it at the deepest just took some time to work to it. The battery life is good for my needs I edge my sidewalks, driveway, retaining wall, and back patio. I saw some reviews where people did not like the direction the blade spins, but I like that it turns away (forward) from me as I don't get dirt and rocks thrown up at my face. I would recommend to anyone that wants their lawn to dominate the neighbors. Rated 5 out of 5 by Alteaux from I should have done this years ago I waited until I used the edger 3 times before the review. I previously used my string trimmer to edge, but even with glasses I felt I was risking my eyes with the amount of rocks hitting me. I have an average size yard with an extra sidewalk in the rear, but have no problems completing my yard with the 3Ah batteries. My 1.3Ah batteries won't quite make it, but come close. This includes edging all concrete and edging gardens. I'm still getting accustomed to edging the raised gardens around my trees, but it's getting easier - just takes some practice. It's light weight and I spend less time than edging with my string trimmer. No problems with my St. Augustine grass. I'm glad I bought this rather than a gas edger. Rated 4 out of 5 by roweone from Gets the job done After seeing mixed reviews, I decided to try out the Ryobi cordless edger. Here is what I found: Battery life - On an 8500 sq. ft. lot I got the job done with 2 fully charged batteries (standard lithium, not lithium +). Cutting ability - In the few spots where my lawn was overgrown I had a harder time but I wouldn't expect a battery powered edger to cut more than an inch or 2 of overgrown grass. If you keep your lawn edged, this tool will work great. The counter-clockwise spinning blade - This is where we lost a star. Having the debris kick forward makes it difficult to see where you're edging. 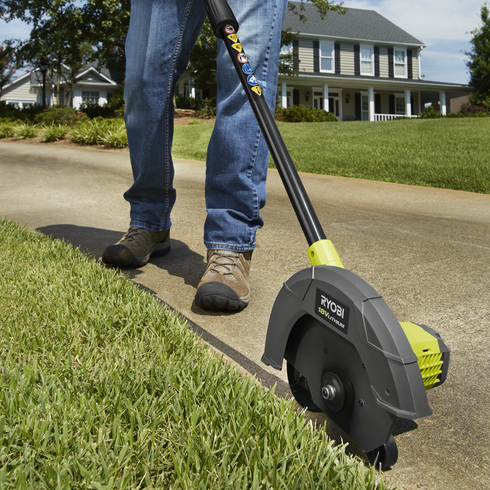 Maintaining a crisp edge on a your lawn is a breeze with the RYOBI ONE+ Cordless Edger. This tool is perfect if you are tired of messing with gas or cords! Simply pop the battery in and your off and running! This edger comes with a 9" dual serrated blade and a 4-position adjustable depth control. The included lithium ion battery will ensure that you get fade free power from start to finish! Best of all, this battery can be used on any tools in the ONE+ family! Max Cutting Depth: 2.5 in. How do I adjust the blade of my edger? How do I store my edger? How do I stop the edger? How do I Replace the blade on the edger? WARNING: Always make sure the blade is correctly installed and securely fastened before each use. Failure to properly install the blade may result in serious personal injury. How do I store the edger?